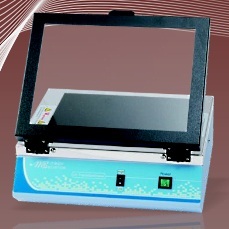 The benchtop MUV21 and MUV26 transilluminator series offers uniform and intense UV light in a compact package, for gel imaging and documentation. There is a choice of viewing dimensions, 21 × 21 cm (MUV21) and 26 × 21 cm (MUV26), single wavelength models offering 254, 312 or 365 nm, and dual wavelength models with 254/312 nm or 254/365 nm available. 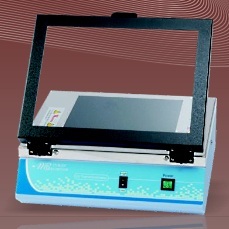 The 365 nm models allow easy viewing by back illumination of gels for extended periods of time without damage. The 254 nm models are used to irradiate samples. The 312 nm models are suggested for general gel operating. The single wavelength models have a high intensity/low intensity switch. The MUV21 and MUV26 series UV transilluminators are compatible with most gel documentation viewing hoods.